The Label field is a special field that enables the user to add some specific data to a subject. This fact can then be used to call a subject's image and data onto a product. A common use of the Label field is to label subjects as teachers. The teachers are associated to a particular grade and can then be used on products such as composites. From Version 3,2 onwards it is possible to import data into the Label field. The text file is imported as per normal via DetailsMode>Subjects>Import text file. 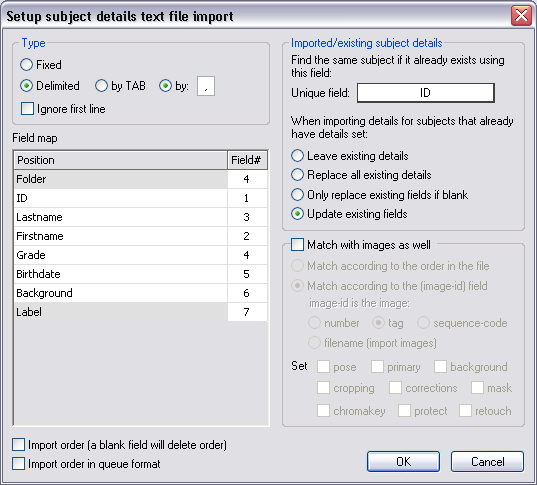 Selecting the setup button allows the user to map the Label field together with other fields in the text file.